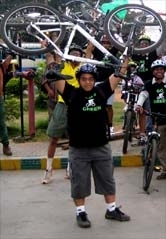 GoGreen Month end endurance ride, towards Big Banyan tree 31Jul11 - GGI-Group size: 4000+ Professionals, Increasing on day to day basis, Come & join us 2 serve Mother Nature. 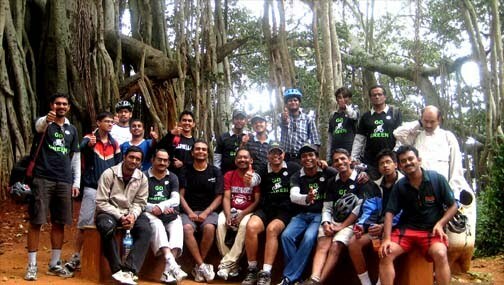 27 GGI's started off to Big Banyan tree, The South GGI's had decided to meetup @ Wheel sports junction by 5:30am & started ride @ 5:45am. Took the ring road via DewaGowda Petrol bunk & hit the Mysore road junction, their after took left towards Rajarajeshwari Arch. This was our 1st pit stop reached 5 minutes early than the set 6:30am. Few other GGI's from other places too joined us. We touched Pepsi factory which was our 2nd pit stop by 7:00am and waited till 7:25am, Soon realized Timmanna & Rajaram were missing hence called only then realized we have come 1 1/2 km ahead hence took a U-Turn and came back to Rajarajeshwari Colleage & hospital and took left turn towards Big Banyan tree & Reached by 8:00am. Our other group headed by Shantu came through magadi road and joined us @ the destination. 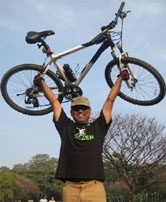 As usual we settled down @ a hotel and started our breakfastThe total bill came up to 900+ and has been sponsered by Mukund on account of purchasing his new Cannondale R-5. After breakfast we entered the Big Banyan tee gate and started taking snaps.. We started back by 9:20am and reached Mysore rd our last pit stop by 9:45am. their after every one dispersed. Following was the route followed.. 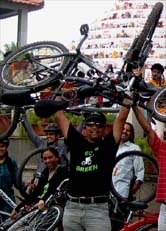 Started from JP Nagar 6th Phase Wheel sports - Devagowada Petrol Bunk 100ft ring road - Mysore Road - Raja Rajeshwari Arch - Kengari upanagar - Nice coridor - Rajarajeshwari Medical college - then Right turn inside Village's green route towards Big-Banyan tree..
GO Green July-11 Month-End endurance ride.